!!! 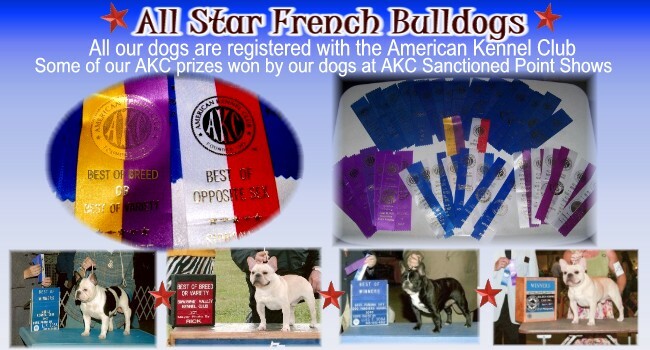 AKC REGISTERED FRENCH BULLDOGS - BORN & RAISED IN THE USA !!! Want to Purchase a Frenchie??? We believe you should do research on the breed before purchasing one. Frenchies are smart, wonderful, funny, beautiful companions, but they have special needs. French Bulldogs are beautiful and a site to see. With their smooshed faces, short stocky torsos and big bat ears they are a wonderful little package... But these very things that make them so great can also produce conditions which make French Bulldogs susceptible to different health conditions. Even dogs that have been health screened and dogs that have earned show titles can produce dogs with certain genetic defects. A breeder cannot guarantee 100% that something will NEVER happen in the future, someone that tells you that is feeding you a sales line to take your money and you should go elsewhere. 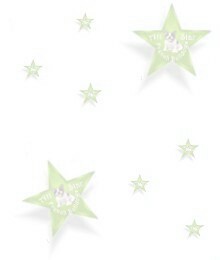 All French Bulldogs are prone to certain diseases ... CLICK HERE to visit a Frenchie Health Issue page. Be aware of those who sell dogs based on RARE colors!!!! Do Your Research" before you buy into these "Sales Gimmicks" seen on many websites using these words such as "RARE", " ONE OF A KIND", "EXOTIC", " MINI" , etc... just to sell puppies. Color does not make a dog any better or any worse, but unfortunately we have unethical breeders trying to cash in on those "rare colors" like BLUE or whatever the latest fad may be. There isn't anything rare about any color listed on the AKC color list, that's just another sales pitch. Those "RARE" colors are considered DISQUALIFICATIONS.... Colors such as Mouse (Blue), Liver (Chocolate), etc... these are diluted colors and not accepted in the AKC Ring anyway. A large majority of diluted coats such as the "Blues", of most Bully Breeds, suffer from chronic skin disorders/allergies. I am sure there are many healthy blues around, just do your research if that is the route you choose. Any line can throw a diluted dog, you don't see them around cause breeders culled them from their line, meaning they purposely breed away from it. This happens with other Bully Breeds, not just the Frenchies. There is no such thing as rare eye color either, blue eyes are a fault/genetic defect and something not desirable. There are no such thing as "Mini Frenchies", the standard calls for them to be 18-28lbs. Some are smaller and less bully than others, but they are all the same breed. Be careful of those selling Frenchies too cheap. Raising and breeding these dogs correctly is NOT Cheap. They are not easy to breed and require lots of care. If you see ads or web sites selling Frenchie Puppies for $1500 or less, BE CAREFUL, that's usually a RED FLAG. More than likely they are importing and buying the puppies in bulk from other countries for a couple hundered dollars, that's usually the only way they can let Frenchie pups go for that cheap. Remember YOU GET WHAT YOU PAY FOR!!!! If it's too cheap, it's probably garbage. Don't let cute puppy pictures fool you, a lot of times scammers steal pictures from online kennels and online web sites and use these stolen pictures to sell their dogs and puppies and it's not even the dog in the picture. Ask for updated or different pictures. If they can't provide them, it's probably not their dog. Be careful of a breeder who is not willing to take their dogs back. Meaning if you have a problem that you can't keep the dog the breeder should take it back and be able to re-home it. I am not talking about giving you a refund. Any Frenchie we produce will always have a home here, if for whatever reason the buyer cannot keep it, we will take it back. We believe the breeder of any dog, of any breed, should take responsibility for the dogs they produce for life. Be careful of breeders or kennels that do not offer some sort of Health Guarantee against hereditary defects. Get it in writing, vocal agreements don't really count unless you absolutely trust the breeder 100% and even then... Just get it in writing! FCI and APRI Champions are NOT the same as AKC Champions. What is going on with many bulldogs is very sad. People bringing in sick puppies from other countries. CLICK HERE TO FIND OUT HOW TO IDENTIFY AN IMPORT OR BROKER. NOTE: I AM SURE THERE ARE REPUTABLE EUROPEAN KENNELS AND BREEDERS AND REPUTABLE BREEDERS FROM OTHER COUNTRIES. THESE LEGIT KENNELS ARE NOT GOING TO IMPORT QUALITY STOCK FOR $700 or $1000 or to have the re-sold here and ruin their reputation. If it's too cheap, it's probably something to worry about. Don't let cute puppy pictures fool you, a lot of times scammers steal pictures from online kennels and online web sites and use these stolen pictures to sell their dogs and puppies and it's not even the dog in the picture. Ask for updated or different pictures. If they can't provide them, it's probably not their dog. We've had our photos stolen, of our own dogs and found them online advertised for sale... BEWARE!!! CHECK OUT THE RESCUE! If you don't care about Pedigrees or showing or don't care where your dogs came from or you want an older Frenchie to adopt or you just want to save an abandoned or abused Frenchie, please check out various rescues out there that have numerous Frenchies available for adoption. All Star Disclaimer: We do not claim to be experts & by listing any information on this page or any page on our site we are not giving expert advice. We have owned Bullies for decades and French Bulldogs for years now, but feel no matter how many years you have in anything, you can never know enough and there is always something new to learn. We do not claim that the information on this website will guarantee that it is correct with anyone else's French Bulldog experience. Please do not use any links or pages on our website to make your decision. If any images are copyright and they belong to you and you would like acknowledgment or removal please email us. Thank You!